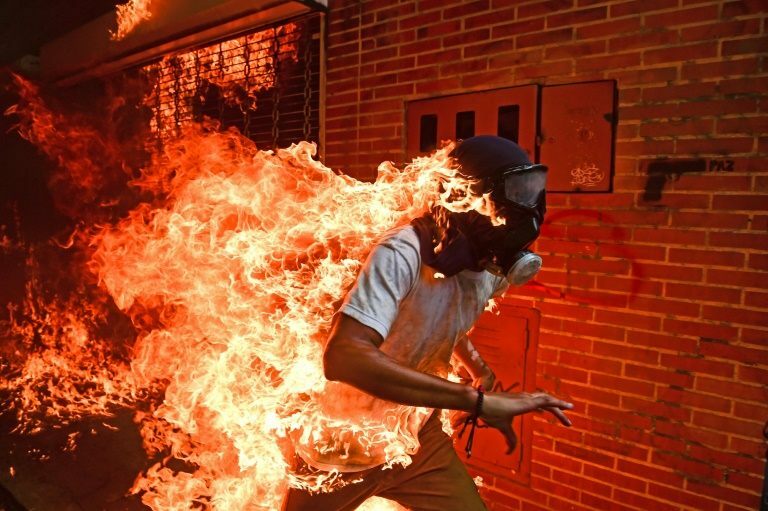 Agence France-Presse photographer Ronaldo Schemidt won the prestigious 2018 World Press Photo of the Year Award Thursday with a fiery image of a masked Venezuelan protester which judges said symbolised a country "burning". His searing image shows Salazar -- who is wearing a mask -- running as a cloak of fire envelopes his body. He survived the incident with first and second-degree burns, the competition's organisers said. Schemidt's own family has been caught up in the hunger, hyperinflation and shortages that sparked the protests -- four months of street battles that left 125 people dead. Accepting his award and speaking in Spanish, Schemidt said he dedicated to photo "to his family and all the people of Venezuela." Hard hit by sharply lower oil prices on the global market, Venezuela is enduring one of the worst crises in its history. Inflation for this year is forecast to hit 13,000 percent. "This is an immensely powerful photo and this is not an easy picture to take," Lars Boering, World Press Photo's director told AFP after the ceremony. Schemidt said he was "very emotional, and very excited" about the award, adding: "I didn't think in that moment that I would win any prize with it, but I was really shocked by what I was seeing because I had never seen something that violent." He beat off stiff competition as overall winner, including images capturing the Rohingya crisis, the war in Iraq and the aftermath of a terror attack in London. In other honours for AFP, Scarff's monochrome photograph of English teams grappling for the ball during the historical annual Royal Shrovetide Football Match at Ashbourne in Derbyshire won the Sports-Singles category. "It's a portrait of what Venezuela was then, but now it's even worse." 0 Response to "'Burning man' image wins AFP top prize at World Press Photo"